Introduction : Of all human achievements art is the most vital, the one that is dowered with eternal youth, for it awakens in the soul emotions which neither time nor civilization has ever radically altered. Therefore, in commencing the study of an art of strange appearance, what we must seek primarily is the exact nature of the complexity of ideas and feelings upon which it is based. Such is the task presented to us, and since the problem which we here approach is the general study of Chinese painting, we must prepare ourselves first to master the peculiarities of its appearance and technique, in order to understand later on the motives which inspired it. Admittedly, Chinese painting is governed by distinctive ideas. Born of a civilization vastly different from our own, it may at times appear in a guise that seems incomprehensible... It is in the realm of painting that this foreign element is most noticeable. This is due partly to a special technique and partly to the nature of the doctrines which serve as its inspiration. It behooves us then to acquaint ourselves with these new aspects of the human soul. That is the justification for this little book. It forms an introduction in which gaps are shown without attempt at concealment and is presented in all modesty. Beauty inhaling the Fragrance of a Peony. Ming Period. I. — Equipment of the Painter. II. — Representation of Formes. III. — Division of Subjects. II. — Before the Intervention of Buddhism. III. — Intervention of Buddhism..
IV. — The T'ang Period — 7th to 10th Centuries. V. — The Sung Period — 10th to 13th Centuries. VI. — The Yüan Period — 13th and 14th Centuries. VII. — The Ming Period — 14th to 17th Centuries. VIII. — The Ch'ing Period —17th to 20th Centuries. Portrait of a priest. Yüan or Early Ming Period. It has often been said that in Chinese painting, in Japanese painting, perspective is ignored. Nothing is further from the truth. This error arises from the fact that we have confused one system of perspective with perspective as a whole. There are as many systems of perspective as there are conventional laws for the representation of space. The practice of drawing and painting offers the student the following problem in descriptive geometry : to represent the three dimensions of space by means of a plane surface of two dimensions. The Egyptians and Assyrians solved this problem by throwing down vertical objects upon one plane, which demands a great effort of abstraction on the part of the observer. European perspective, built up in the fifteenth century upon the remains of the geometric knowledge of the Greeks, is based on the monocular theory used the latter. In this system, it is assumed that the picture is viewed with the eye fixed on a single point. Therefore the conditions of foreshortening — or distorting the actual dimensions according to the angle from which they are seen — are governed by placing in harmony the distance of the eye from the scheme of the picture, the height of the eye in relation to the objects to be depicted, and the relative position of these objects with reference to the surface employed. Tiger in a Pine Forest. Eighteenth to Nineteenth Centuries. Portion of a scroll by Ku K’ai-chi. its mighty principle, its manifold manifestations and the secret which unveils itself in the innermost soul of things are the conceptions which form the inspiration of Chinese painting. These lofty thoughts are the source of that spirituality which declares itself therein with such nobility. The religion to which they are due will seem perhaps, to certain people, to be broader and less trammeled than our own. There is no doubt that the entire Far East was under the spell of its grandeur. Up to this point art had sounded every depth and attained the highest summits of human achievement. Thenceforward it concerned itself with varying manifestations which were only the different modes of a formula that was still flexible, until the time when — the great inspirations of the past forgotten — there appear signs of a spirit on the quest for realism, emerging from the ancient tradition. This is the distinctive note in the evolution of Chinese painting under the last two dynasties. It would seem as if, even in this guise, a universal need of the mind is being satisfied, a need which we, too, have known after experiencing a chilling academicism, and when modern culture had overthrown the ancient idols. Chinese painters have thus completed a round analogous to that traveled by our own artists. For the Far East as for Europe, the problem now presented is that of a revival. Bent beneath the weight of the prestige of the past, too learned in the last word of culture, modern art is seeking to find itself, groping blindly, full of promising but unfinished works. The time has come when there are signs throughout the world of a desire for a universal civilization, by the reconciling of ancient divergencies. Europe and the Far East bring into contrast the most vigorous traditions in history. Henceforward there is interest for both civilizations in studying and in coming to understand a foreign ideal. Ku K'ai-chih [Gu Kaizhi] — Also called Chang-k'ang and Hu-tou, was born in Wu-hsi in the province of Kiang-su. He lived at the end of the fourth and beginning of the fifth century. His style, resembling that of the Han period, informs us as to the character of painting from the second to the fifth century. It is such as to indicate a long antecedent period of cultivation and development. Hsieh Ho [Xie He] (479-502) — Painter of the figure. He wrote a small book setting forth the Six Canons or Requirements of painting. This work informs us regarding the philosophy of art in China of the fifth century. Wu Tao-tzŭ [Wu Daozi]. — Also called Wu Tao-yüan. Born in Honan toward the end of the eighth century. His influence was felt in Japanese art as well as in that of China. He painted landscape, figures and Buddhist subjects. Li Ssŭ-hsŭn [Li Sixun] (651-715 ou 720). — Is considered as the founder of the Northern School. He appears to have felt the influence which Buddhist art brought in its train. Li Chao-tao [Li Zhaodao], son of Li Ssŭ-hsŭn, lived at the end of the seventh and beginning of the eighth centuries. He is said to have varied from his father's style and even surpassed it. Wang Wei. — Also called Wang Mo-k'i (699-759). — Poet, painter and critic. The great reformer of Chinese landscape painting. Considered as the founder of the Southern School and the originator of monochrome painting in Chinese ink. Han Kan [Han Gan]. — Renowned in the period t'ien-pao (742-759). According to tradition he was a pupil of Wang Wei. His school possessed in the highest degree knowledge of the form, characteristics and movements of the horse. Tung Yüan [Dong Yuan]. — Tenth century. Landscape painter. He worked in both the Northern and Southern styles. Chü Jan [Juran], Buddhist monk. Tenth century. He was at first influenced by the work of Tung Yüan, but later created an individual style. Ma Yüan. — End of the twelfth and beginning of the thirteenth century. Member of the Academy of Painting. He was the author of a strong and vigorous style which characterized the school founded by him. Hsia Kuei [Xia Gui]. — Served in the college at Han-lin in the reign of the Emperor Ning Tsung (1195-1224). He was considered a master of chiaroscuro and atmospheric perspective. Ma Lin. son of Ma Yüan. — Thirteenth century. His work shows that he painted even more in the tradition of the Southern School than his father and uncle. Li Lung-mien [Li Longmian] or Li Kung-lin [Li Gonglin]. — Born at Chou in Ngan-huei. He held public offices, which he resigned in 1100 to retire to the mountain of Lung-mien, where he died in 1106. Noted for his calligraphy as well as for his painting. At one time in his life, under religious influences, he painted a great number of Buddhist figures. Mi Fei [Mi Fu] or Mi Yüan-chang or Mi Nan-kung (1051-1107). — Calligraphist, painter and critic. He used strong inking in a style in which the simplification of monochrome is carried to the extreme. He had a son, Mi Yu-Jen, who painted in his father's style and lived to an advanced age. 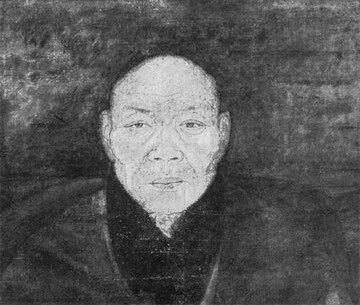 Hui Tsung [Huizong]. — Emperor, poet, painter and calligraphist. Born in 1082, ascended the throne in 1100, lost his throne in 1125 and died in captivity in 1135. In the first year of his reign he founded the Academy of Calligraphy and Painting. He made a large collection of valuable paintings and rare objects of art which was scattered at the plundering of his capital by the Tartars in 1225. Chao Mêng-fu [Zhao Mengfu]. — Also called Tsŭ-ang. Born in 1254. Man of letters, painter and calligraphist. He was a great landscape painter and in the first rank as a painter of horses. Ch'ien Hsüan [Qian Xuan]. — Also called Ch'ien Shun-chü, lived at the end of the thirteenth and beginning of the fourteenth century. He painted figures, landscape, flowers and birds. He employed the style and methods of the Sung dynasty. Yen Hui. — Lived in the thirteenth and fourteenth centuries. His paintings were numerous and indicate a master of the first order. He painted many Buddhist and Taoist subjects. Huang Kung-wang [Huang Gongwang]. — Fourteenth century. At first influenced by the style of Tung Yüan and Chü Jan, he later acquired an individual style and was one of the great founders of schools in the Yüan period. Ni Tsan [Ni Zan]. — Also called Yün-lin (1301-1374). Man of letters, calligraphist, collector of books and paintings. He is considered to be one of the greatest painters of his time. Chou Chih-mien. — Lived in the fifteenth and sixteenth centuries. His subjects were principally birds and flowers. 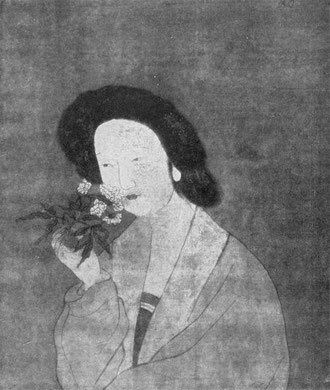 Shên Chou, also called Shên Ki-nan or Shên K'i [Shen Zhou] (1427-1507). — Landscape painter. His composition is at times overladen, as is often seen in Ming art. Lu Fu. — Lived in the fifteenth century. He made a special study of the plum tree in monochrome. He is comparable to the great Sung masters. Wang Yüan-chang. Died in 1407 at the age of 73. He painted the bamboo and plum tree in monochrome. He carried on the Sung tradition, with which he was directly connected, and was the founder of a school. Wen Chêng-ming [Wen Zhengming] (1480-1559). — Painter, poet and calligraphist. He is often compared with Chao Mêng-fu. Yün Chou-p’ing [Yun Shouping], appellation Nan-t'ien, true name Yün Ko (1633-1690). He studied at first under the influence of Wang Shu-ming and Siu Hi. He painted figures, flowers and landscape. Shen Nan-p’ing [Nan-P'ing-Shan]. — Lived in the seventeenth and eighteenth centuries. He was called to Japan in 1720 and founded there the school of Ming-Ch'ing or the modern Chinese school. 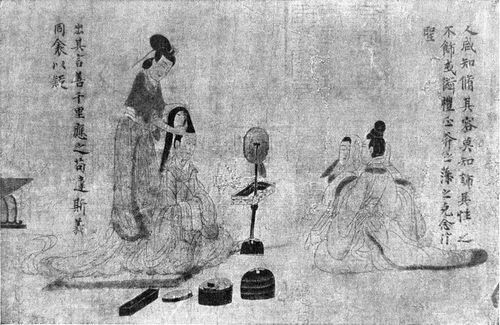 Huang Yin-piau or Huang-shên. — At the height of his career between 1727 and 1746. 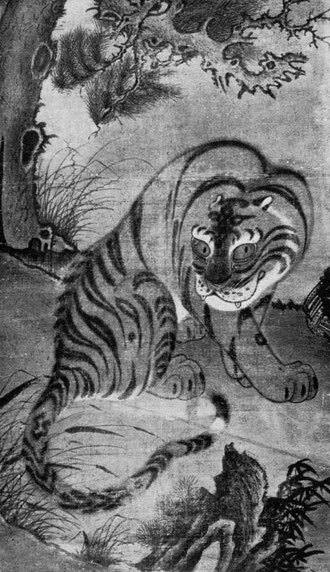 He painted landscape and, toward the end of his life, legendary figures of Buddhism and Taoism with a technique that was skillful but often precise and somewhat weak.